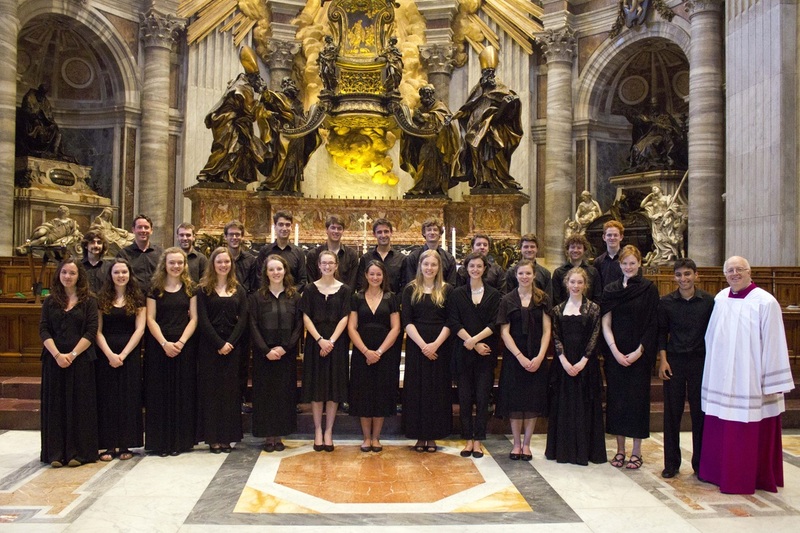 The 2014 Summer Tour, 3rd-9th July, saw 25 members of the choir visit the spectacular Italian capital, Rome. Meeting in Gatwick at an hour too early, there was a general sense of excitement (from those who could keep their eyes open) as the tickets and music were distributed and the traditional limited edition tour t-shirt was revealed. Our early start was rewarded with a midday arrival in Rome, where we were immediately greeted by the warm Italian sun that would be ever-present throughout the tour. After salvaging our suitcases from the bizarrely brutal baggage carousel, we set off together to find our coach driver. The greeting, however, was not so warm - more an expression of confusion. Conscious that we could not possibly expect the level of efficiency experienced when using the German train system during the 2013 tour, we had booked a minibus transfer to our hotel in advance, yet somehow 25 seats had been inexplicably confused with 8. After much gesticulating from both sides, and the revelation that our Italian was currently limited to the very basics plus a composite selection of Latin GCSE vocabulary, a new driver and a bigger bus belatedly arrived and we were on our way. Having checked in to our superb hotel, Hotel Navona, the nearby sights were explored by the group, including the Piazza Navona and the Pantheon. We also had our first sample of Italian pizza, pasta and wine before we set off across the city to the Anglican Church in Rome, All Saints’. After a fast-paced rehearsal, we sang at Evensong where we performed the Bernard Rose Responses, Tertius Noble’s Canticles in B minor and what would become a tour favourite, Edward Bairstow’s ‘Let all mortal flesh keep silence’. The delighted parishioners expressed their thanks, kindly organising a post-Evensong drinks reception. After dining as a group at the nearby Pizza-Re, home of the traditional thick-crust Roman Pizza, we wound our way back to the hotel via a scenic route that took in the Spanish Steps, the Trevi Fountain (which unfortunately was covered in scaffolding) and lots of delicious ice-cream. Choir members in front of the Pantheon. The first full day, Friday 4th, was an opportunity for more sightseeing, with the choir splitting into separate groups. A contingent ventured to Ostia, the ancient harbour city that is now a large architectural site, while others explored Villa d’Este Tivoli, more commonly known as the Tivoli Gardens. The majority spent the day within Rome, first exploring the treasure trove that is the Vatican Museums before visiting the Forum and magnificent Colosseum. Choral Scholar and more importantly Classics Scholar, Leo Jennings, served as the perfect tour-guide, combining leading critical and personal opinion with supreme wit. In the Vatican Museums, the fineries of hair styles and their development in Roman sculptures were examined; the intricate construction of Trajan’s Column and the numerous purposes of the Forum and Colosseum were similarly discussed. After enjoying an early evening glass of prosecco in the Campo di Fiori, the whole group gathered together at the Restaurant Osteria la Quercia, where the incredible pasta dishes were a real highlight. We spent the night at the Summer Festival taking place on the banks of the Tiber, where in true LCCC style, the party very much started with our arrival. 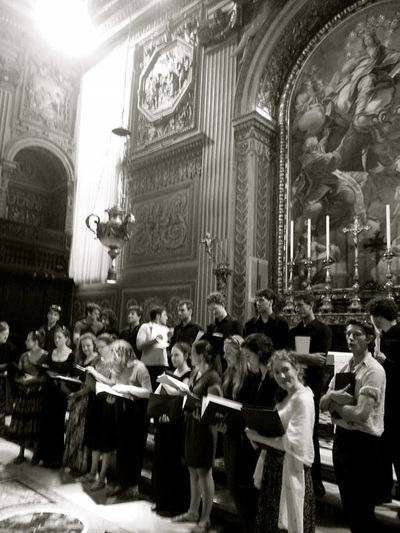 The choir in the Basilica di Santa Maria Maggiore. Saturday morning and afternoon offered a further opportunity for sightseeing (again the group split, with visits to Rome’s numerous churches, the Caracalla Baths, and traditional Roman markets) before we ventured across the city to Santa Maria Maggiore for our evening Mass. At the largest Catholic Marian church in Rome (notable as there are 25 other such churches) we performed to a packed congregation. Music included Monteverdi’s ‘Cantate Domino’, Duruflé’s ‘Ubi Caritas’ as well as the aforementioned Bairstow and Bruckner’s ‘Ave Maria’, all of which resounded beautifully in the expansive acoustic. A quiet evening was spent in Piazza Navona as we admired the impressive fountains and enjoyed some more ice cream. The choir in St Peter's Basilica. The organ scholars in St Peter's Basilica. Choir members enjoying manuscripts from the Vatican Archives. The choir in the Chapel of the Chapter. 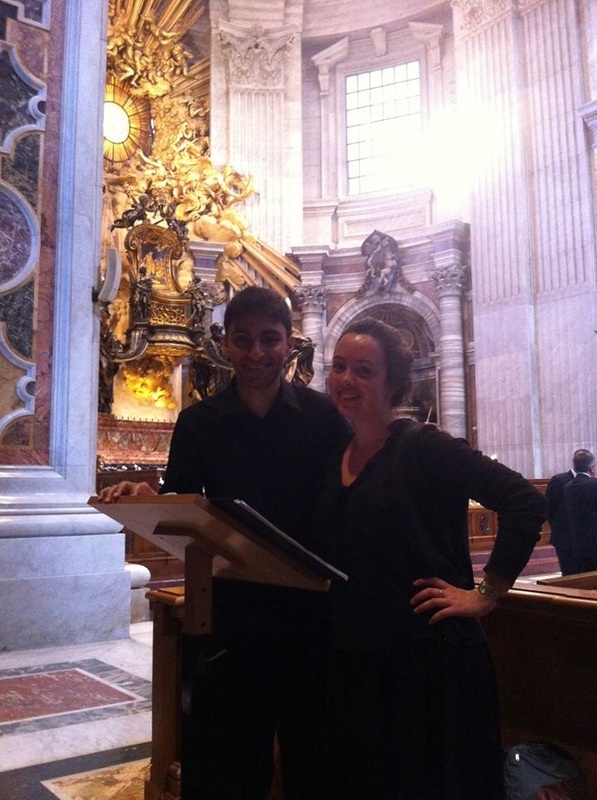 Sunday was perhaps the highlight of the tour as we sang for the High Mass in St Peter’s Basilica, the Vatican. Departing our hotel in the morning, we walked together to the Vatican, collecting a large number of parents, friends and family members who joined us for the service en route. In the incredible setting that is St Peter’s Basilica, we sang Lassus’ ‘Jubilate Deo’, Byrd’s ‘Ave Verum’, as well as the Duruflé and the Monteverdi we had sung the day before. The Mass was attended by 2 Cardinals, 7 Bishops, around 40 Priests and a congregation of over 500. A real highlight was singing Gregorian Chant in alternation with the cantors of the Capella Guilia, conducted by Fr Pierre Paul, Maestro of the Capella Guilia - it was a service that we will all forever remember. At the end of the Mass, the choir were thanked by the presiding Cardinal who had attended the service especially to hear us. Fr Pierre Paul was also highly impressed by our singing, and after a group picture in front of the altar, he casually mentioned that the Pope would be saying the midday Angelus in a matter of minutes in St Peter’s Square. This news led to a quick exit from the side of the Basilica and a sprint down its length, as we joined the huge crowd that had assembled to see Pope Francis. Yet the day was to become even more incredible thanks to Fr Pierre. Having treated us to lunch in a nearby restaurant, he led us back to St Peter’s and into the Archives of the Chapter, where a display of the Music of Capella Guilia had been especially put out for the choir. 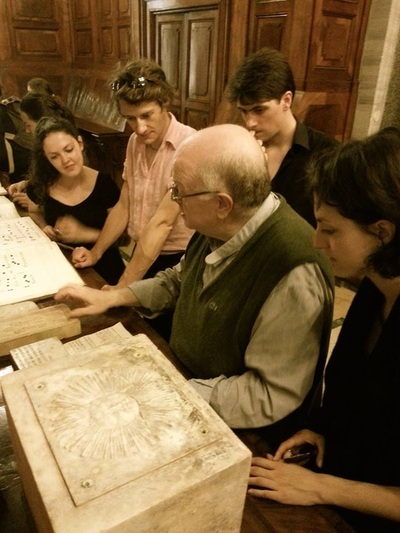 Alongside 14th century manuscripts of Gregorian chant were original manuscripts of works by notable Italian composers who held the position of Maestro of the Capella Guilia, such as Stefano Fabri and Niccolò Jommelli. From there Fr Pierre took us to the Chapel of the Chapter where, closed off to the public, we were given the extraordinary opportunity to sing in the private chapel (check out the videos below!). At the beginning of the 18th century, the composer Domenico Scarlatti was the organist here, and the altar in the chapel is a piece of Roman Art dating from the 1st century BC. Finally, Fr Pierre led us once more through the private passages of the Vatican, bypassing the queues as we climbed to the viewing platform at the top of St Peter’s Dome. The views offered across the city of Rome were truly breathtaking. The day, however, was not over and no sooner had we caught our breath, we were once again walking across the city to the wonderful Basilica San Clemente al Laterano. The Bruckner and Lassus were performed once again, alongside Byrd’s Mass for Four Voices and the 2014 choir favourite, Josef Rheinberger’s ‘Abendlied’. Several of the congregation had heard us in the Vatican in the morning and had ventured across Rome to hear us once again. 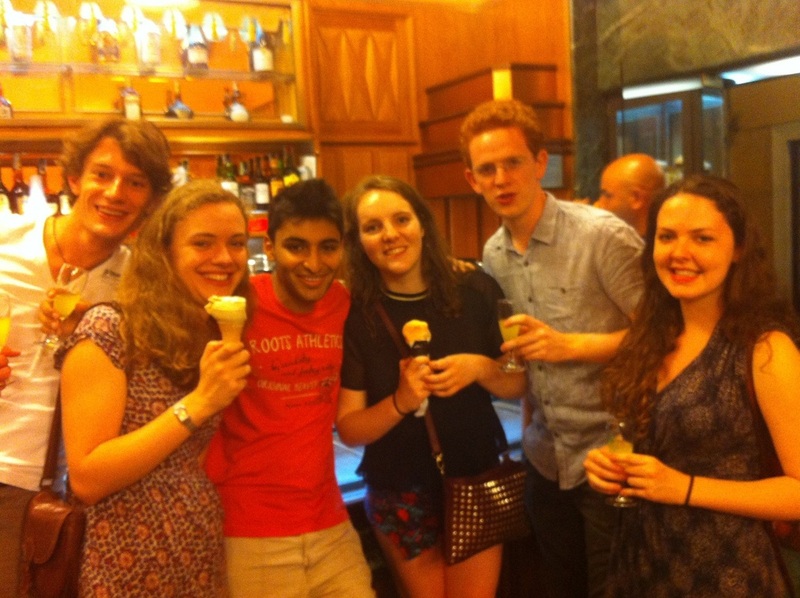 After dinner in a restaurant just of Piazza Navona, a long but hugely successful day was rounded off in the famous Roman ice cream parlour Giolitti’s, where the array of ice cream flavours as well as the Limoncello, Campari and Grappa on offer were very much enjoyed. Choir members enjoying some ice cream. The choir at Villa Wolkonsky. Canapés and beautiful gardens at Villa Wolkonsky. 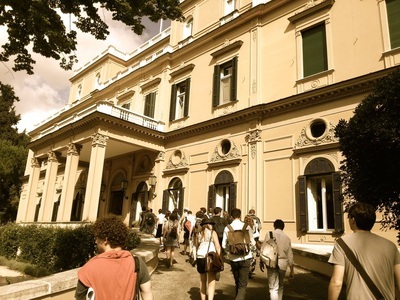 VIlla Wolkonsky, the British Ambassador's residence in Rome. After a busy few days of singing, Monday offered a chance to relax – an opportunity we made the most of by having a picnic in the Villa Borghese Gardens. Embracing the famous phrase ‘When in Rome’ gastronomically, the picnic included a spread of cheeses, hams, bread, tomatoes and fruit accompanied with wine. We also spent time exploring the gardens and rowing on the central lake with a technique that was at odds with the surrounding tranquil scenery. Nonetheless, after an enjoyable day, we headed back toward our hotel, enjoying dinner in the nearby Restaurant Il Fico before visiting the nearby ice-cream parlours: San Crispino and Grom are highly recommended! Our last full day in Rome offered the final opportunity for some last minute sight-seeing and shopping before we set-off across Rome to the spectacular residence of the British Ambassador to Italy, the Villa Wolkonsky. 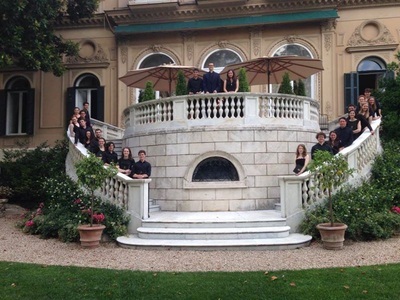 The magnificent villa and gardens served as a glorious setting for our recital, where we performed an array of both sacred and secular music to an audience of invited dignitaries, Lincoln College Alumni based in Italy and the embassy staff. 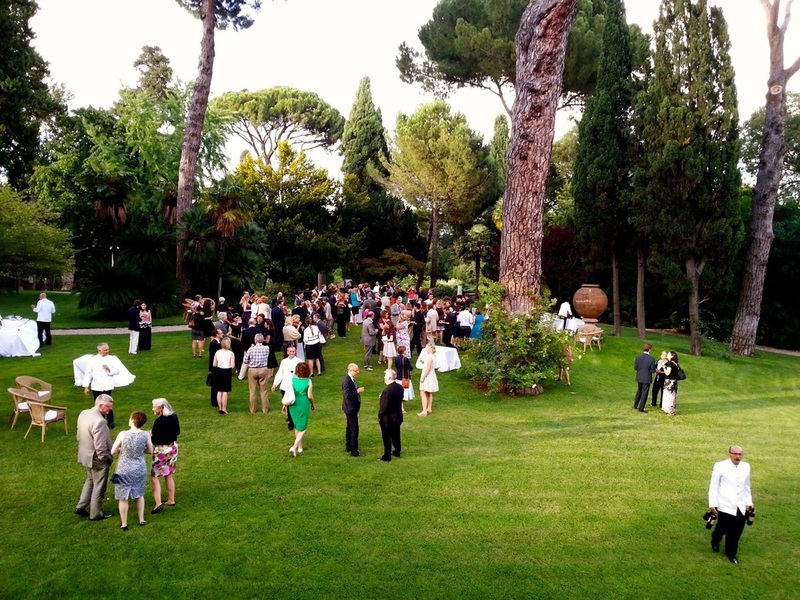 There followed a sumptuous buffet of Italian canapés – we’d all grown very fond of stuffed zucchini flowers over the week – and a chance to explore the garden, before we closed the evening with a final selection of madrigals and a rendition of the song ‘So Happy Together’ by The Turtles. Returning back to the centre of Rome, we enjoyed a final dinner at Da Francesco’s on the Piazza del Fico, followed by drinks outside the Pantheon – a wonderful end to a truly wonderful week. Click on the videos below to watch us perform Bairstow's Let all mortal flesh keep silence and Bruckner's Ave Maria. A tour over a year in the planning would not have been possible without the help of several individuals, and on behalf of the choir and Chaplain, I would like to express our thanks to the following: Iestyn Evans, Charles Cole and Eliza Chubb for providing numerous contacts and advice for churches, restaurants and accommodation in Rome; Mike and the staff of Hotel Navona for looking after us so well; Fr Pierre Paul (St Peter’s Basilica), The Revd Marcus Walker (Anglican Centre of Rome), Andrew Cochlin (All Saints’ Church), Fr John Cunningham (Basilica San Clemente), Fr Stanislaus Maria (Santa Maria Maggiore) and the British Ambassador to Rome, Mr Christopher Prentice and all the staff at the Ambassadorial Residence for giving us the opportunity to perform in such wonderful venues; Tim Knowles, Celia Harker and the Accounts Office for their support, advice and patience throughout the organisation process; Kairen Bradford and Carmella Elan-Gaston for their administrative support; and finally, all the staff in the development office for their continual support of the tour and the choir’s endeavours. Thank you also to the Rector, the Fellows of Lincoln College for their unwavering support, and to the JCR, MCR and Old Members’ Fund, without whose financial support the tour would not have been possible.